Local people are being asked to get out into Bushy Park this August to volunteer for a study that could help protect a rapidly disappearing UK habitat, home to a host of tiny creatures. Wildlife experts from The Royal Parks charity are asking people of all ages to become ‘citizen scientists’. 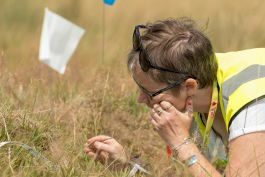 By donating just a few hours of their time, they could help prove a simple method for dating precious acid grassland areas, which cover parts of Bushy Park, identifying the oldest and most important. These areas are an ideal home for a unique mix of mini-beasts, including types of ants, beetles, bees, wasps and crickets. The study is part of the charity’s Mission: Invertebrate initiative, supported by the players of People’s Postcode Lottery, which aims to discover more about the tiny creatures that live in London’s parks and play a vital role in our ecosystems, and to get people involved in conservation work to help them thrive. 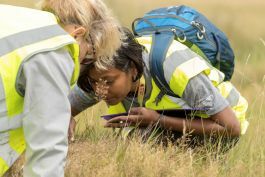 The Royal Parks charity believes that the ant hills found in Bushy Park and Richmond Park could hold the key to identifying Britain’s most precious grasslands, helping to protect them. Volunteers will be asked to measure the volume of the ant hills, which are often overlooked or mistaken for mounds of earth by park-goers. They hope to prove that the biggest ant hills match up to the oldest and most ecologically rich pastures, which have seen the least disturbance from humans. A similar study at Richmond Park last year backed up the theory. Volunteers can choose from dates and times throughout August, and are asked to commit a minimum of two hours of their time. A pre-survey training session offers the opportunity to learn more about the extraordinary ants from top ecologists. Visit www.royalparks.org.uk/missioninvertebrate to register for the study or find out more. For media enquiries or interview requests contact: 0300 061 2128 or press@royalparks.org.uk. Invertebrates are creatures without a backbone, including insects like ants, beetles, flies and bees, as well as snails, slugs and worms. Invertebrates play a vital role in our ecosystems, pollinating plants, breaking down green waste and providing a food source for birds and small mammals. Over 95% of all known species of animals are invertebrates. The Royal Parks is a charity created in March 2017 to manage and fundraise for 5,000 acres of Royal parkland across London. Every year 77 million visitors enjoy London’s eight Royal Parks for their unparalleled opportunities for enjoyment, exploration and healthy living in the heart of London. The Royal Parks are Bushy Park, Richmond Park, Kensington Gardens, Hyde Park, The Green Park, St James’s Park, The Regent’s Park and Greenwich Park. The charity also looks after other important open spaces in London, including Brompton Cemetery, Victoria Tower Gardens and Canning Green. The parks are owned by the Crown with their responsibility resting with the Secretary of State for Culture, Media and Sport. The Royal Parks charity manages the parks on behalf of the government.